President Barack Obama ratcheted up pressure on congressional Republicans to authorize an increase in the nation’s debt limit, warning of potentially catastrophic results for many Americans and the overall economy if the U.S. were to default on its obligations. 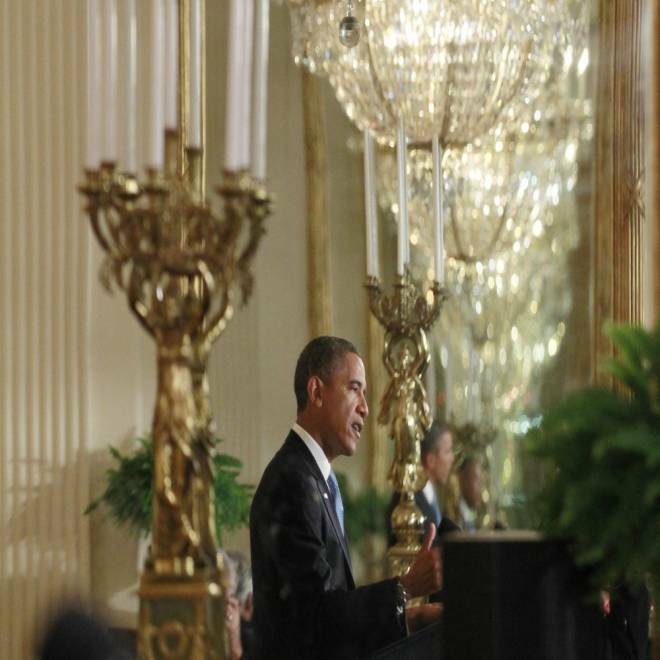 President Barack Obama is reflected in a mirror as he speaks during a news conference in the East Room of the White House, Jan. 14, 2013. Anticipating a politically bruising fight this spring with the GOP – members of which in Congress have increasingly and openly discussed the prospect of refusing to raise the debt ceiling or allowing a government shutdown – Obama urged lawmakers to avoid using the vote over the debt limit as a point of leverage. And the president sought to frame the risks of default in stark terms. He warned markets would go “haywire” if Congress would not act; Obama said that interest rates would rise, and checks to Social Security beneficiaries and military veterans would cease. But as some Democrats urge the administration to consider options to sidestep Congress and assert the authority to unilaterally authorize more borrowing, Obama all but ruled out these sorts of “Plan B” options. President Obama responds to a question from NBC's Chuck Todd during his last press conference of his first term, warning of the dangers of the nation defaulting on loans, stating that it "would be disastrous." All but ruling out these fallback maneuvers, Obama’s pronouncement all but ensures another incident of brinksmanship versus Republicans in Congress. The past two years of Obama’s presidency were marked by showdowns with House Republicans on taxes and spending that turned acrimonious and extended in most cases to the last possible minute. Fights over extending government funding and raising the nation’s debt limit took the government to the verge of shutdown and default, respectively, in 2011. And the unresolved issues from those debates culminated in the “fiscal cliff” showdown at the end of last year. Though Republicans eventually acceded to Obama’s demand that taxes be allowed to rise on the wealthiest Americans, something that was passed with mostly Democratic votes, the fiscal cliff agreement pushed back a series of automatic spending cuts for two months. As a result, the deadline at which Congress must authorize the government to borrow more basically overlaps with the deadline at which the government runs out of money for its day-to-day operations. Republicans have argued that tax rates are now settled, and have suggested they intend to use those rapidly-approaching deadlines to extract new spending cuts and entitlement reforms that were absent from the New Year’s deal to handle the tax component of the fiscal cliff. But these battles could exhaust much of the political capital won by Obama during his re-election last November. The president will formally be sworn into his second term on Sunday. And while planning for that second term is well underway, top priorities like confirming new cabinet secretaries, reforming the nation’s immigration system and passing new measures to address gun violence might be imperiled by a protracted and bloody fight with Republicans over spending. President Obama says the GOP's political differences with him makes socializing a problem. Watch his comments. Obama said that he would detail one of those initiatives, his administration’s proposals to curb gun violence, later this week. But even as the president renewed his support for stricter magazine regulations and tighter background checks – along with a ban on assault weapons – Obama nodded to the difficulty in passing those proposals. “Will all of them get through this Congress? I don't know,” he said. For their part, Republicans argue that Obama and his administration have been largely unserious about actually addressing spending – the primary cause of the mounting national debt, in the GOP’s view. Republicans cite the president’s request for more infrastructure spending as part of his fiscal cliff negotiations as indicative of the White House’s disinterest in actually cutting spending. “The president and his allies need to get serious about spending, and the debt-limit debate is the perfect time for it,” Senate Minority Leader Mitch McConnell, R-Ky., said in a statement. In a statement following the president’s press conference, House Speaker John Boehner said, “The consequences of failing to increase the debt ceiling are real, but so too are the consequences of allowing our spending problem to go unresolved. Without meaningful action, the debt will continue to act as an anchor on our economy, costing American jobs and endangering our children's future." But much of Obama’s remarks on Monday were directed toward framing the political terms of that debate, which might dictate the outcome of these impending fights as much as ideological motives.